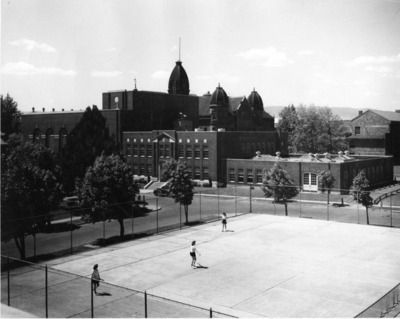 This image shows tennis courts in the foreground and McConnell Auditorium and the towers of Barge Hall in the background. The camera view is looking southwest. Central Washington University, "McConnell Hall" (1950). CWU Building Photographs. 188.